In a Car Accident? 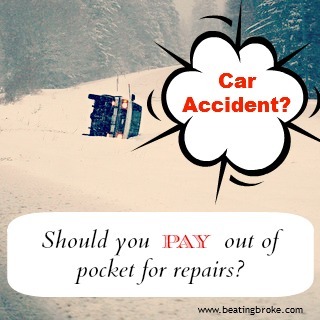 Should You Pay Out of Pocket for Repairs? Our Chicago winter this year has been a lot less like a Midwest winter–the snow storms have been few and far between. A few weeks ago we finally got hammered by a storm that dumped 10 inches over the city. At the height of the snow storm I had to pick up my son from school. As I waited at a stop sign, the driver behind me bumped into my bumper. Luckily, the damage wasn’t bad. When I took it to a repair shop for an estimate, they thought it would cost between $580 and $1,200 to fix depending on if there was any damage inside the bumper when they take it off to repair it. Surprisingly, the woman who hit me decided she wanted to pay out of pocket rather than go through insurance. When I told her that the repair would take 2 to 3 days and we’d need a rental car during that time, she agreed to cover that cost, too. This is the second time I’ve been rear-ended in 5 years, and both times the repairs were less than $2,000. Both times the drivers opted to pay out of pocket. 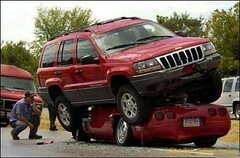 If you’re in a minor fender bender, should you pay out of pocket rather than going through insurance? 1. If you have a high deductible. If you have a deductible of $1,000, for example, paying out of pocket if the repair is just a few hundred dollars over that amount may make sense. You’ll save yourself from an increasing premium. 2. If your insurance premium will increase substantially. Each insurance company is different, but rest assured that if you cause an accident and file a claim, your insurance will increase. Some insurers increase your premium by 10% and others by 20%. You may be able to call your insurer and ask how much the premium will go up before you decide to pay a claim or not. 3. If this is your second accident. While you’ll pay an increased premium for one accident, if you file two claims within a few years of one another, the increase is substantial. For instance, State Farm generally charges a 10% increase in premium for the first claim, but that amount increases to 45% for the second claim. While it may hurt your budget to come up with a thousand or two to pay out of pocket for the repairs, that may be the better option if you’re facing a substantial increase that could last several years. 4. If your insurance doesn’t have an accident forgiveness clause. Some insurers offer an accident forgiveness clause, meaning, if you’ve been with the company for a certain number of years (usually 5 to 9) with no accidents, the insurance company won’t increase your premium on the first accident you file. Again, though, you may want to save this benefit for a more substantial accident that you can’t afford to pay out of pocket rather than when the repair is relatively minor. If you cause an accident, don’t automatically file a claim. There are benefits to paying out of pocket. You just need to understand your insurance policy as well as know exactly how much the repairs will cost before making a decision. If you’ve caused an accident, did you pay out of pocket rather than filing a claim? Over the years, it has become increasingly more common for people to rent cars or to drive abroad when they are going on holiday. With the increase in people driving vehicles abroad, there is also the inevitable increase in road traffic accidents. If you are involved in a road traffic accident abroad that was not your fault and have suffered injury, you can still make a claim for compensation. Car accident claims involving drivers from other countries or in another country are on the rise and you should contact an experienced lawyer to help you with your claim. If you are involved in such an accident, you should attempt to get as much information as possible from the other driver as you would do at home. In most countries, the Police will take a full report and you should ask for a copy, even if it is in another language. You should obtain the registration number of the vehicle involved and the details of the other driver and their insurance information. Depending on the nature of your injuries, you should seek medical treatment as soon as possible either in the country you are visiting or as soon as you get home. If you are able, take photographs of the scene. Make sure you contact a personal injury lawyer who has experience dealing with car accident claims. Depending on where your accident occurred, they will be able to advise you on your claim and the next steps. For example, if your accident occurred in an EU state and the insurer has a registered office in your country, a claim may be made directly to that registered office. If you rented your car as part of a package vacation, you may alternatively be able to make a claim under the Package Tour Regulations which are designed to protect vacationers and would allow a claim to be made against your tour operator. If the driver responsible for your accident fails to stop or has no insurance then you still may be able to make a claim through your insurance provider, or the rental car agency. In some cases, if you’ve paid with a credit card, the credit card company will provide you with insurance on rental cars. It’s always a good idea to find out what kind of insurance there is available to you through those avenues before leaving for a trip.